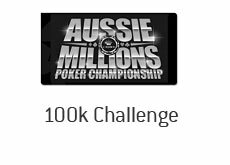 In a tournament field packed with well-known names (I mean, who else would have the money to pony up almost $70k USD for a single tournament entry), David Steicke shocked everyone to take down the 2009 High Rollers Challenge at the Aussie Millions for $1.2 million dollars AUD. It wasn't just that Steicke won - it was the WAY that he won. He completely dominated the tournament, especially on Day 2. He made the right reads, he made well-timed bluffs and he got lucky at just the right times. In short, Steicke put together a masterful performance, and his victory was well-deserved. As mentioned, the tournament was loaded with great players. Phil Ivey, Patrik Antonius and Tony G all decided to enter the event. In all, 23 of the best poker players in the world entered this tournament, creating a prize pool of $2.3 million dollars AUD. This was David Steicke's largest lifetime tournament cash. His previous largest was a $166k cash in a $2k No Limit Hold'em event at the 2008 World Series of Poker. People didn't know who David Steicke was before the High Rollers tournament started - I can guarantee that they will know his name now.